WHAT ARE YOU EXCITED ABOUT FOR THE 2018 SEASON? I’m most excited about meeting all the new first year members coming into the band. Playing a role in their development is something I’ve enjoyed the past few years. Everyone comes in eager to learn and carry on our traditions. WHAT IS YOUR FAVORITE PART OF THE SMB? My favorite part about the SMB is the sense of family everyone has with one another. It’s a big group, but if you ever need any help or advice someone is always willing to help. Whether you know people well or not, everyone is willing to help. WHY DID YOU AUDITION FOR THE BAND? I auditioned for the band because of the deep-rooted history and traditions the SMB has. The staff is historically excellent and I wanted to be a part of a group that was the best of the best. WHAT HAVE YOU LEARNED THROUGH BEING A PART OF THE SMB? I have learned that you can always do more. You can always be a better marcher, musician, and person. You should always seek to lend a helping hand, improve yourself, and learn all you can. WHAT ADVICE DO YOU HAVE FOR THOSE AUDITIONING FOR OR NEW TO THE SMB? I am most excited for what the band can bring in 2018. We had a great start with Dr. Thornton and It will be exciting to see the continued growth. 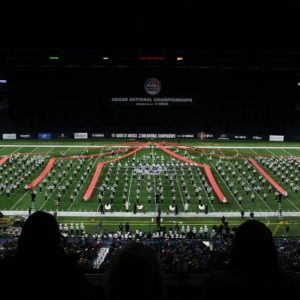 We have a planned trip to perform at Bands of America. The production for that show is going to be very fun and I’m intrigued to see the creative juices that go into the show. Lastly, there is also a huge buzz around the football team. When 19 of the 22 starters are set to return for the football team, that always draws interest. My favorite part of being in the SMB would have to be all the opportunities we have to perform and cultivate relationships. Some of my life-long friends were met through this ensemble. The support we have from each other and the community is truly what gives this group a family-like environment. 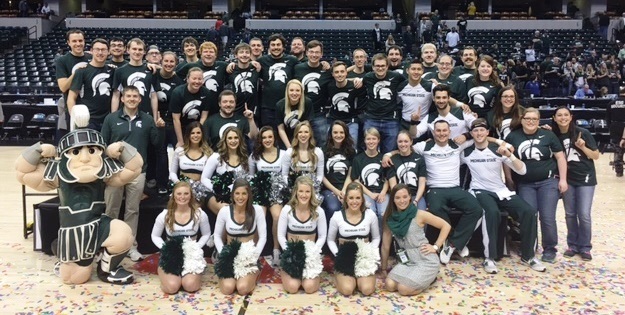 Growing up, I knew that the MSU drumline was one of the top college drumlines in the country. A handful of my instructors, and friends had been a part of it and I did not want to miss out. It was also a great opportunity to learn from Dr. Jon Weber, someone I had known about since I was 14. Since then, Dr. Weber has been one of the largest influences throughout my time here at Michigan State. The SMB has taught me that this group is much like a strong tree. The roots are strong, and we continue to grow taller and stronger. It is a welcoming group with individuals that will go out of their way to make sure your experience is one that you won’t forget. My advice to those auditioning would be to have fun. Auditioning is very scary, I understand that. But, the more you can be yourself and allow your personality to shine through, the more enjoyable it will be. Everyone is rooting for you and we all want to see you at your best. Also, if you know people in the band, reach out! Those people are good resources and would be more than willing to help out. Arris Golden, a skilled conductor, music educator and band director currently leading the Marching Tar Heels of North Carolina at Chapel Hill, will join the faculty of the Michigan State University College of Music as the assistant director of bands and associate director of the Spartan Marching Band. Her appointment will be effective July 1. Golden is known as an accomplished educator with extensive experience leading marching, concert and symphonic bands. Golden was drawn to MSU because of the level of artistry and commitment to excellence she saw within the band program. 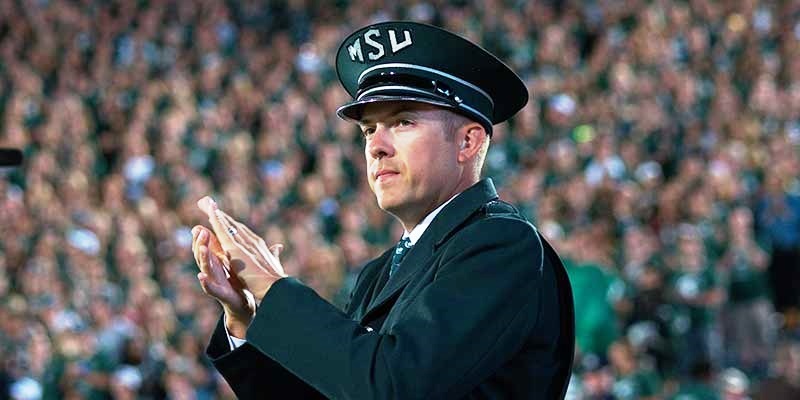 The depth and breadth of the MSU band program requires a leader of Golden’s caliber who has worked with multiple types of bands at multiple levels. She brings a proven ability to relate to students of a variety of ages and backgrounds. 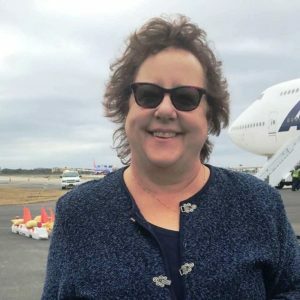 Her middle school concert band leadership, for example, led to international recognition and featured performances and premieres of commissioned works at respected music education conferences. Golden said she is looking forward to teaching and working with students at all levels of the band program. She is excited, too, about interacting with area high school students through the Spartan Wind Symphony and with students who come from all parts of campus via the Spartan Marching Band. 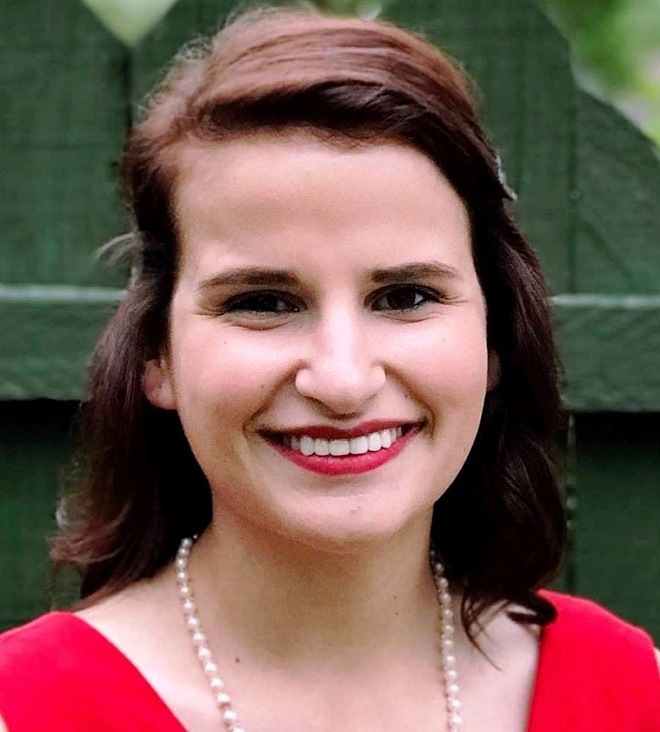 Her familiarity with MSU comes from her involvement in its band programs as a graduate student having recently completed the DMA in wind conducting. Arris Golden is the newly appointed assistant director of bands and associate director of the Spartan Marching Band at Michigan State University. She officially beings her new position in July 2018. 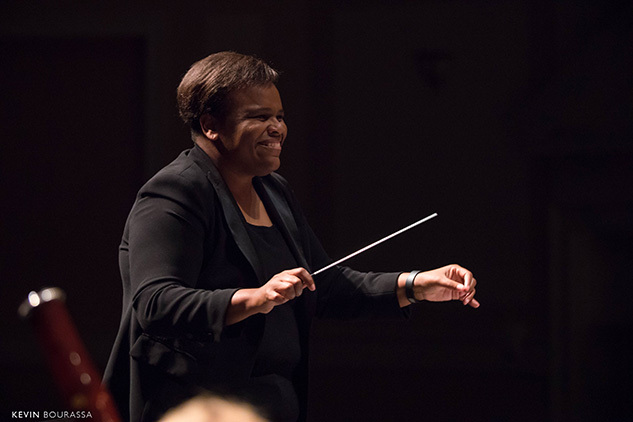 Golden is currently a member of the conducting faculty at the University of North Carolina at Chapel Hill and serves as the assistant director of University Bands. In this position, she is the music director of the 265-member Marching Tar Heels, director of the Women’s Basketball Pep Band, conductor of the Symphony Band, guest conductor with the Wind Ensemble. She also teaches courses in music education. Prior to her appointment the University of North Carolina at Chapel Hill, Golden was director of athletic bands at Campbell University in Buies Creek, North Carolina (2008-2009). While at Campbell, she oversaw the entire athletic band program, including the inaugural year of the “Sounds of the Sandhills” Football Pep Band and the Men’s and Women’s Basketball Pep Bands. In addition, Golden served eight years as the director of bands at Gravelly Hill Middle School in Efland, North Carolina. During her tenure, Golden conducted an internationally recognized middle school concert band that participated in featured performances at the North Carolina Music Educators Association annual conference, in Winston Salem, North Carolina (2010) and at the Midwest Band and Orchestra Clinic, in Chicago, Illinois (2012). The bands at Gravelly Hill also worked with numerous clinicians, including the premier of four commissioned works for band: “Kitsune: The Fox Spirits,” by Brian Balmages (2009), “The Machine Awakes” for young band and electronics by Steven Bryant (2012), “Freight Train,” by Pierre LaPlante (2013), and “The Cave Your Fear” by Michael Markowski (2014). Golden holds degrees from the University of North Carolina at Chapel Hill and the University of North Carolina at Greensboro. She recently completed the doctor of musical arts in wind conducting from Michigan State University as a 2014 recipient of a Michigan State University Distinguished Fellowship. 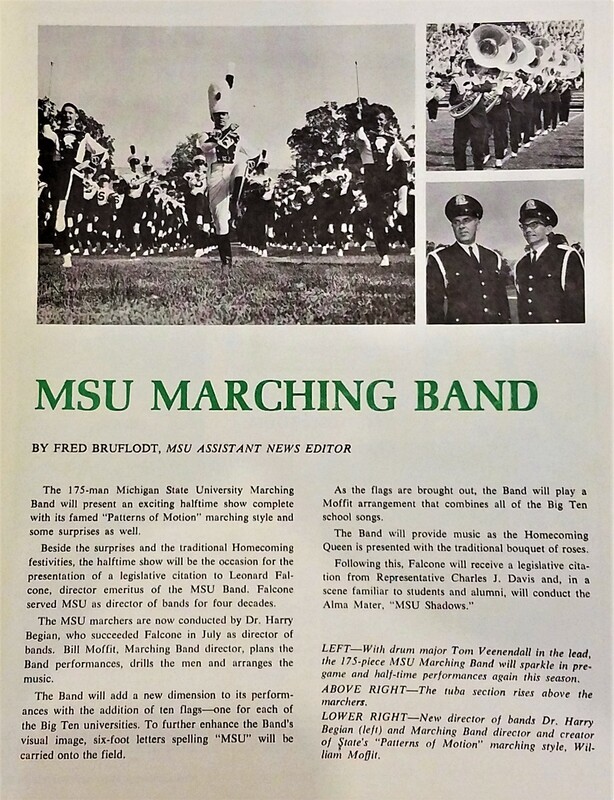 In Fall 1967, following the retirement of longtime Spartan Marching Band director Leonard Falcone, renowned conductor Dr. Harry Begian was named director of bands at MSU. Dr. Begian came to MSU from his alma mater Wayne State University where he had been director of bands for three years. 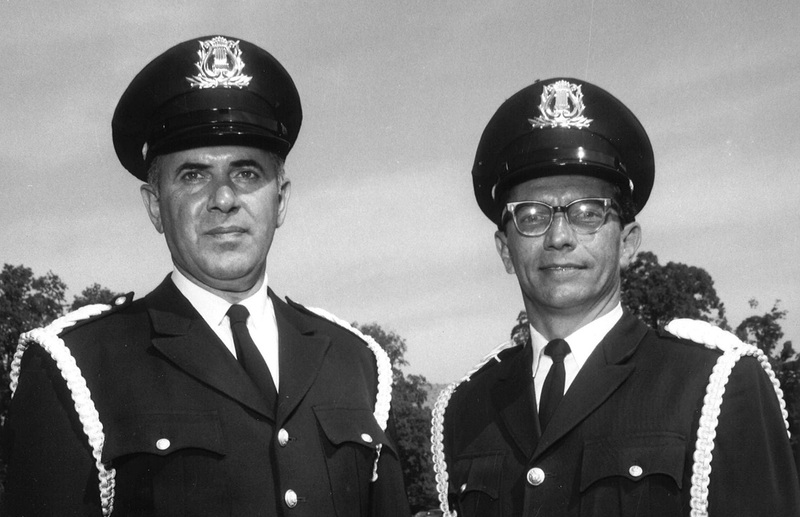 Begian together with SMB assistant director William Moffit directed the marching band from 1967 to 1969. The end of Falcone’s tenure as director marked the end of one era and the beginning of another for the Spartan Marching Band. A number of changes were made in 1967 with Dr. Begian’s arrival at MSU. “The word among the music trade is that Mr. Moffit and I will hit it off as a team and should have a band second to none, and that is exactly what we hope to do,” Begian said in a September 1967 interview with the State Journal. Among Dr. Begian’s first actions as director was to add eight E-flat trumpets to the ensemble to enhance the soprano voice in instrumentation. Begian also decreased the number of clarinets in the Spartan Band and increased the number of alto and tenor saxophones. Perhaps one of Begian and Moffit’s most innovative additions to the band in 1967 was the Big Ten Flag Corps. The Spartan Marching Band debuted ten new flags in its 1967 Homecoming performance according to the program from that game. Each of the ten flags represented one of the Big Ten Universities, emblazoned with the name of the school and its colors. Flags have been added over time to reflect the additions of Penn State, Nebraska, Maryland, and Rutgers to the conference. The fourteen Big Ten flags lead the SMB in all parades, including the gameday march to Spartan Stadium. The Flag Corps also leads the band on to the field of Spartan Stadium during the band’s famous kickstep field entrance. The Big Ten Flag Corps typically do not perform during halftime, however the section participated in the “Summer of 1967” halftime show this season to celebrate their 50th anniversary. 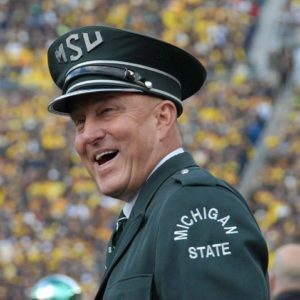 While the flags are a beloved tradition in the SMB, it is important to note that they are not unique to MSU. Purdue University originated the display of flags representing its Big Ten counterparts. Longtime Purdue director of bands Paul Spotts Emrick introduced the Big Ten Flags to the Purdue “All-American” Marching Band in 1919. The SMB and AAMB happen to have more in common than just the Big Ten Flags. The two bands share a director in William C. Moffit, who was the assistant director of the SMB, 1960-1969, and director of the AAMB, 1981-1988. Moffit made an indelible impact at MSU with his musical arrangements, including his arrangement of Victory for MSU, popularly known as “Pregame Fight” by band members. Moffit is also the innovator behind Patterns in Motion, the constant-motion four-person squad marching system, still used by the SMB in its pregame routine today. With the 1967 season now 50 years behind us, the current Spartan Marching Band and its alumni can look back on the impacts a single season had on the band’s growth and future. 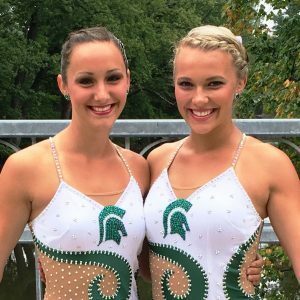 Directors Begian and Moffit certainly left their mark on the band program at MSU. Moffit’s arrangements of many tunes are still performed by the SMB today and the band’s current instrumentation is a direct result of the changes Begian made during his first season. 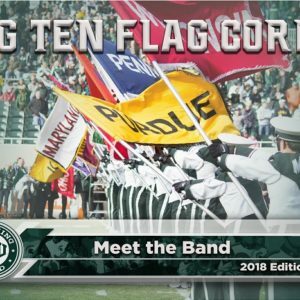 The most apparent impact on the band from 1967 is the addition of the Big Ten Flag Corps, a section of dedicated band members who carry the colors of our opponents and set the tone of intensity as the Spartan Marching Band moves down the street and onto the field of Spartan Stadium on gameday. Photographs Courtesy of Michigan State University Archives and Historical Collections. Audition packets with cover letter, three letters of recommendation, resume, and DVD or website link to video at the bottom of your resume are due by January 1, 2018. 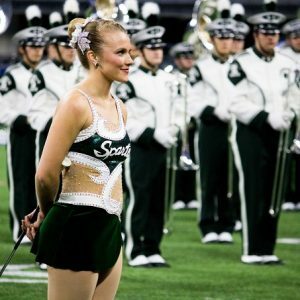 As a History major, Museum Studies minor, and Spartan Marching Band member, I have had the unique opportunity to combine my studies in history and museology with a Spartan Band focus. During Fall 2016, I began an internship with the MSU Museum History Collection through the MSU Museum Studies Program. This internship afforded me the chance to gain valuable real world hands-on experience in the Museum. Given my membership in the Spartan Marching Band and my familiarity with its history, the opportunity to take inventory and assess the Museum’s collection of MSU Band materials was exciting, educational, and rewarding. The Michigan State University Museum, among the earliest established museums in the United States, is the steward of approximately one million objects reflecting disciplines and fields such as Natural Science, Archaeology, Anthropology, Folk Arts, and History. The History and Culture Collections consist of about 100,000 artifacts, of which less than five percent is on exhibit at any given time. 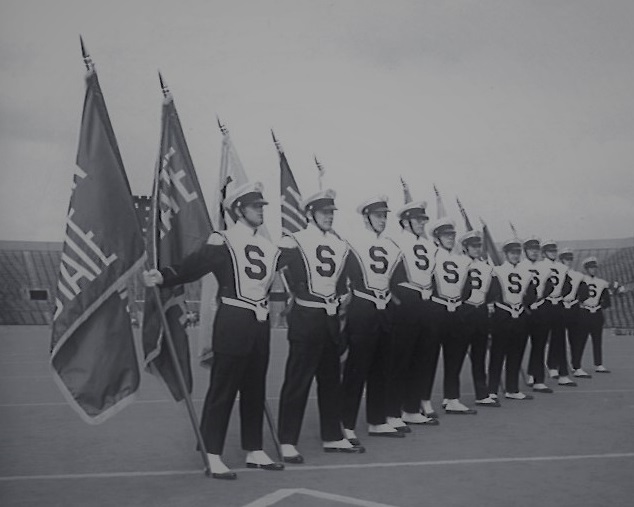 The Spartan Band materials are among the objects carefully housed for research and preservation when not on display in the MSU Museum, located at 409 W. Circle Drive. The MSU Band was established in 1870. The earliest band-related materials in the MSU Museum’s collection date to the early twentieth century. A large portion of the band collection is ephemeral paper material, such as concert programs and photographs. Exploring the selection of band photographs, one might find a large panoramic photograph of the Michigan Agricultural College Military Band or a snapshot of an early band member dressed in his khaki uniform. Most directors of the Michigan State Band are represented in the Museum’s collection through snapshots, uniforms, and personal belongings. Materials include numerous awards and medals from Leonard Falcone, mementos of William Wiedrich’s years as a member of the band and as director, and a plethora of photographs documenting John T. Madden’s 28 years in the position. Aside from the paper and photograph portion of the collection, the MSU Museum also maintains numerous band-related textiles. Primarily composed of uniforms, the Band textile collection includes early Cadet Corps Band uniforms and the first green and white Spartan Band uniform worn from 1952 through 1964. 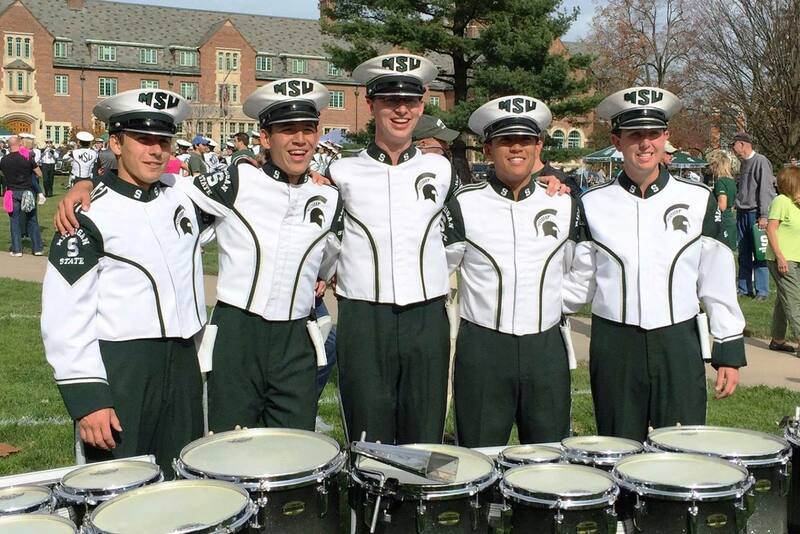 This inaugural green and white uniform is now accompanied by nearly every successive Spartan Band uniform from the last 65 years. Many directors’ uniforms, like those of Leonard Falcone, Kenneth Bloomquist, and John Madden, are also featured in the Museum’s collection. 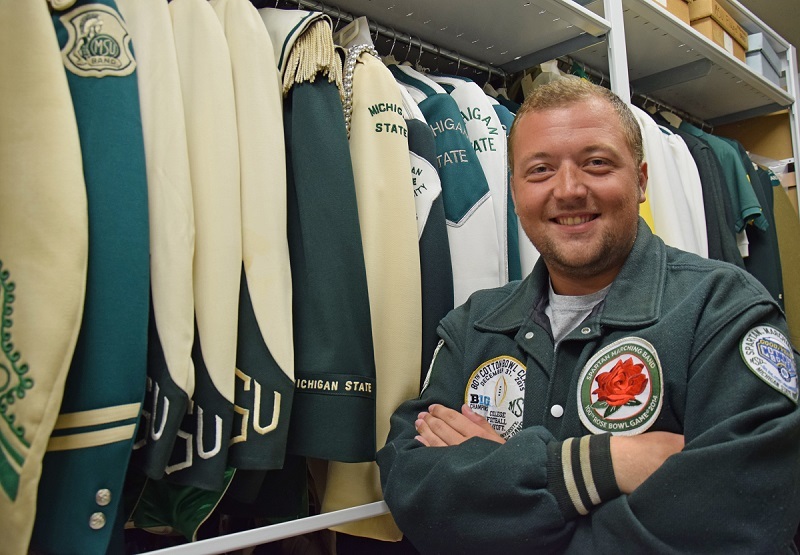 Several Band Jackets, including an early 1950s prototype, find their home in the collection as well, many adorned with varying section and bowl game patches. Michigan State’s first Rose Bowl appearance in 1954 is commemorated with a Band Jacket patch, the original artwork for which can be found in the collection. Aside from the Spartan Marching Band materials, the museum collection also houses objects related to the MSU Alumni Band, Swartz Creek Band, Spartan Brass, and various concert ensembles. 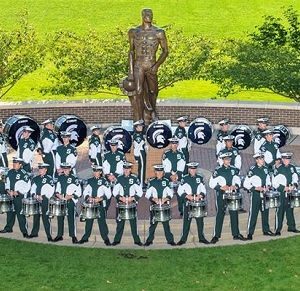 Did you know that the Spartan Marching Band has performed for five U.S. presidents? Did you also know that the 1988 Rose Bowl game ball was gifted to the Spartan Marching Band by head coach George Perles? Answers to these questions and more can be found in the extensive collections of the Michigan State University Museum. To learn more about the MSU Museum and for information on how to access collections for research, visit museum.msu.edu. Information and access to collections courtesy of Michigan State University Museum. Auditions for the 2017-18 Spartan Brass will be Thursday, October 5, 2017, from 7:00 PM to 9:00 PM in the Music Building. 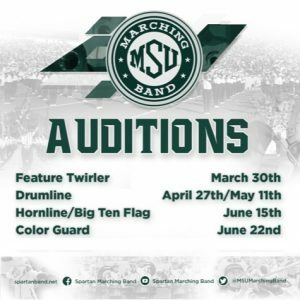 Sign up for audition times on the board outside the MSU Band office (room 116) in the Music Building. Spartan Brass is a second semester, 1 credit ensemble. All students who earn a position in the Spartan Brass must enroll for one credit. Music, uniforms, procedures, and season schedule to be discussed. Alto Sax (10), Tenor Sax (6), Trumpet (30 = 10 1st, 10 2nd, 10 3rd), Mellophone (10), Trombone (20 = 6 1st, 7 2nd, 7 3rd), Baritone (12), Tuba (6-8), Electric Bass (2), and Drum Set (3-5). Instrumentalists should prepare a solo or etude, no longer than two minutes. Contrasting styles are recommended. A marching band excerpt is acceptable, but NOT ADVISED. Percussionists (drum set players) must exhibit mastery of all styles and sight reading ability. All Drum Set players will play for Dr. Jon Weber on or before Oct 11 at Dem Hall. Email or see Dr. Weber for details (drumline@msu.edu). Electric Bass players All E. Bass players must attend the first rehearsal on Oct 12th in Dem Hall and perform with the band (sight read). Bring your own E. Bass, we will supply the amp. Send email to dtt@msu.edu to confirm your spot. The 2017 Spartan Marching Band recently enjoyed a delicious pancake breakfast thanks to the sponsorship of 40 band families, and many early morning volunteers. 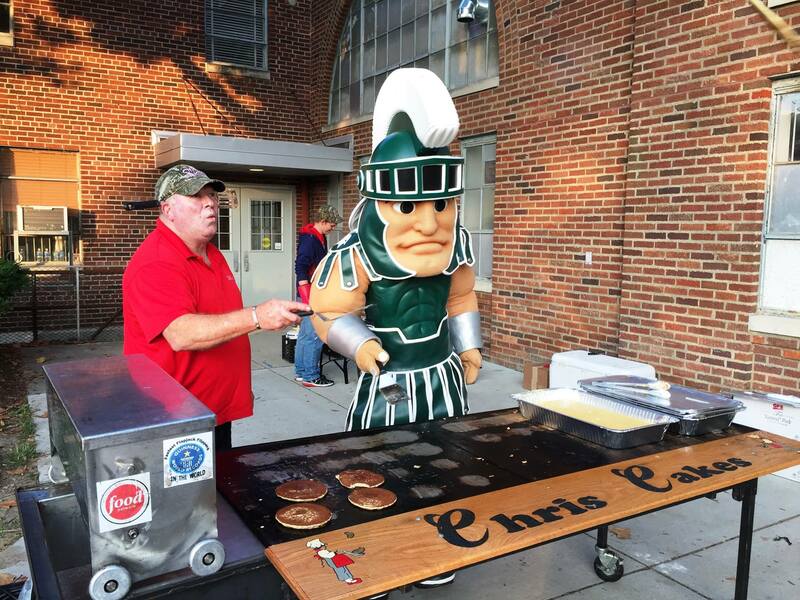 The 2nd Annual SMB Preseason breakfast was held on Saturday, August 26 outside of Dem Hall and included fresh pancakes off the griddle, hash browns, scrambled eggs, sausage, juice and coffee. Sparty joined the band in these early morning festivities, mingling with everybody, twirling batons, playing the trombone and flipping pancakes himself. We are looking forward to the 3rd annual event next August. As a result of the many generous contributions, enough money was raised to donate $300.00 back to the marching band jacket fund for 2017. The SMB Color Guard will hold one (1) additional audition day for the 2017 SMB season. All prospective members will experience a morning group class in movement and flag that includes fundamentals along with choreography. After lunch, there will be a brief review and then the audition will proceed in small groups. Auditionees will meet with staff immediately following the audition to receive feedback and results. Those selected for the color guard will report to SMB preseason training on August 21st. To register, please fill out the following Google form. Location: Band Hall in Demonstration Hall. Please wear darker clothes that you move well in and are able to properly show your skills. Ladies, a hair tie is expected to keep your hair out of your face. Water, gloves and a great attitude! We will provide all equipment. We are looking at grace, poise, attention to detail, athleticism, connection of body with equipment, quick adaptability to style + technique, strong performance, strength, consistency, attitude. The desirable candidate will have all of the above attributes or the right-mix along with a strong desire/passion to improve and grow into the skill set necessary to succeed at Color Guard at MSU. In announcing the appointment, James Forger, dean of the College of Music, praised David Thornton for the experience, energy and artistry he will bring to his new role. The 300-member band was founded in 1870 and has grown into one of the premier college marching bands in the nation. Thornton has been part of the band’s leadership team for the past five years. 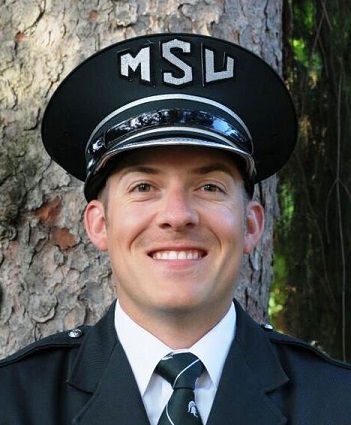 He came to MSU as a graduate student in 2012 and joined the faculty of the College of Music in 2015 as assistant director of bands and assistant director of the SMB. As part of his duties, he will also conduct the Symphony Band and Spartan Brass. Thornton succeeds Professor John Madden, who has announced his retirement from the university, effective Aug. 16. Kevin Sedatole, MSU professor of music and director of bands, has worked closely with Thornton, first as his conducting mentor and more recently as a colleague. A native of Springfield, Va., Thornton received master’s and doctoral degrees in wind conducting from MSU and holds bachelor’s degrees in music education and clarinet performance from Florida State University, where he held the position of head drum major of the FSU Marching Chiefs. Thornton began his teaching career leading middle school and high school band programs in Melbourne and Tallahassee, Fla. Under his leadership, bands from Tallahassee’s Leon High School received peer-reviewed invitations to appear at the College Band Directors National Association Southern Division Conference, the Savannah (Georgia) Music Festival and the Florida Music Educators Association State Conference. From his very first SMB rehearsal in 2012, Thornton was impressed with the band’s culture of comradery and its performance excellence. Read the full article on the MSU College of Music website. David Thornton, assistant director of bands was appointed director of the Spartan Marching Band effective June 14, 2017. Photo by Mark Hansen.